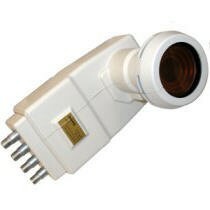 If you have a KU-Band motorized dish, this is the ONLY LNB you need! The Invacom QPH-031 LNBF provides simultaneous reception of both linear and circular polarized signals with an incredible 0.3dB noise figure and 55dB gain! The Quad output design allows for twin switched output of the linear signals and twin switched output of the circular signals. Receive both types of satellites with one LNBF. No more hassles of off-setting a 2nd LNBF!